Today, Treasury Secretary Tim Geithner revealed the Obama administration's plan to get credit flowing by buying toxic assets from troubled banks through a public/private partnership. The government will create a large investment fund out of the bad assets and sell them off to investors with the hope that once the market recovers, the assets will create big profits. Since banks need to sell the assets at a higher value than investors are willing to pay for them, the government will front most of the money in the transaction. Geithner said that he hopes to create a purchasing power of $500 billion and perhaps "up to $1 trillion over time." A few prominent economists have already come out against the plan, including Nobel Prize winning economist Paul Krugman. Writing in the New York Times, Krugman argued that the Obama administration is treating a serious crisis like a simple bank run and that Geithner's plan is but a rehash of what former treasury secretary Henry Paulson once proposed. 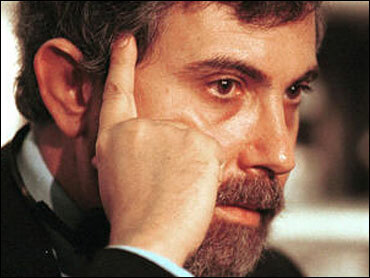 Krugman advanced the "Swedish solution": nationalizing insolvent banks. He expressed strong concern that this is President Obama's only shot to create a meaningful solution to the bank crisis and said that if it fails, Mr. Obama won't have the political capital to try again. Development economist Jeffrey Sachs also expressed his disapproval. "In essence, the FDIC is transferring hundreds of billions of dollars of taxpayer wealth to the banks," Sachs wrote in Huffington Post. He foresees a scenario where banks will reap profits from the toxic assets as the FDIC experiences major losses. Other economists support Geithner's plan. Mark Zandi of Moody's Economy.com, for example, wrote that "This plan has a good chance of success; certainly much better than the plan Treasury put forward six weeks ago." He added that the banks "need to get toxic assets off the books ASAP." And Berkeley's Brad DeLong wrote on his blog that the plan is a "positive step" that lets the government shoulder the risk. DeLong argues that the government is much more risk-tolerant than private firms, and, as such, it should shoulder most of the bad asset burden while nurturing banks back to health. Brookings Institute economist Douglas Elliott, meanwhile, offered an ambivalent view. He said that the program offers sufficient incentives to lure investors in and have them purchase the toxic assets. But he also said that it's too early to tell whether Geithner's plan will solve the asset problem and that "there are substantial reasons to be concerned that the program will… prove to be too expensive for the taxpayer."